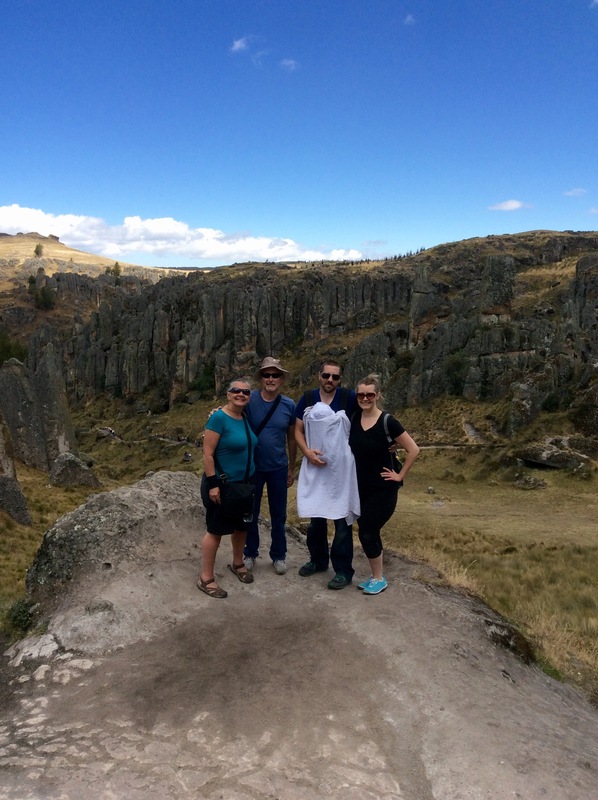 In Peru’s northern highlands, Cajamarca is situated 8,900′ above sea level and has a mild highland climate and very fertile soil. It is well known for its dairy products, Spanish colonial architecture as well as its tragic history where the Spanish slaughtered the Incas. The Plaza de Armas, Cajamarca, Peru. From Ollantaytambo we taxied (2+ hours) to Cusco and took a 70-minute Latam flight to Lima and then 45-minute flight to Cajamarca. Remember, I booked these flights using 8000 American Airlines miles! See this link about Travel Hacking. The hotel shuttle delivered us to our hotel where we met up with my daughter, son in law and 8-month-old granddaughter! 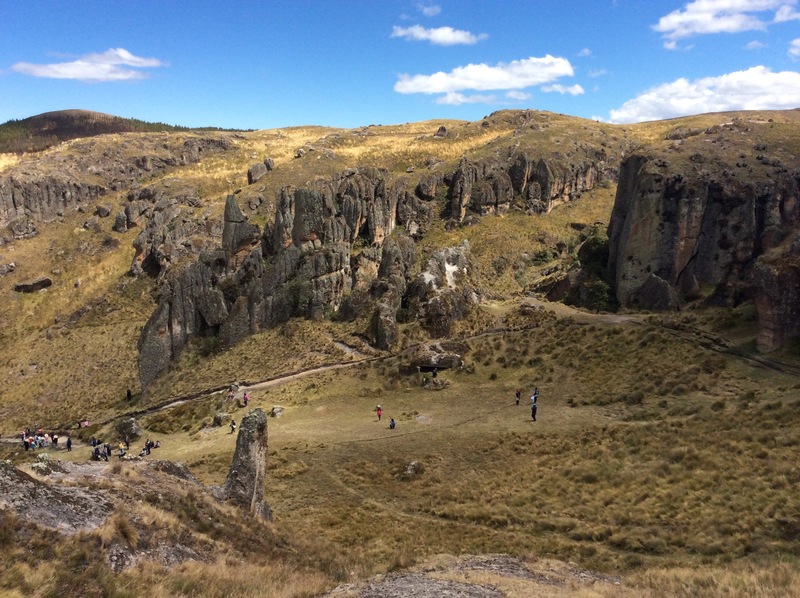 A Brief History Lesson: Between 1463 and 1471, the Incas conquered Cajamarca. In 1532 Atahualpa defeated his brother Huáscar in a battle for the Inca throne in Quito (in present-day Ecuador). On his way to Cusco to claim the throne with his army, Atahualpa stopped at Cajamarca where he encountered the Spanish conquistador Francisco Pizarro and 168 soldiers. In the subsequent battle, Atahualpa was captured and offered a room filled with gold and silver in ransom for his freedom. The Spaniards accepted the ransom and still executed Atahualpa! The city of Cajamarca and its surroundings have been occupied by several cultures. 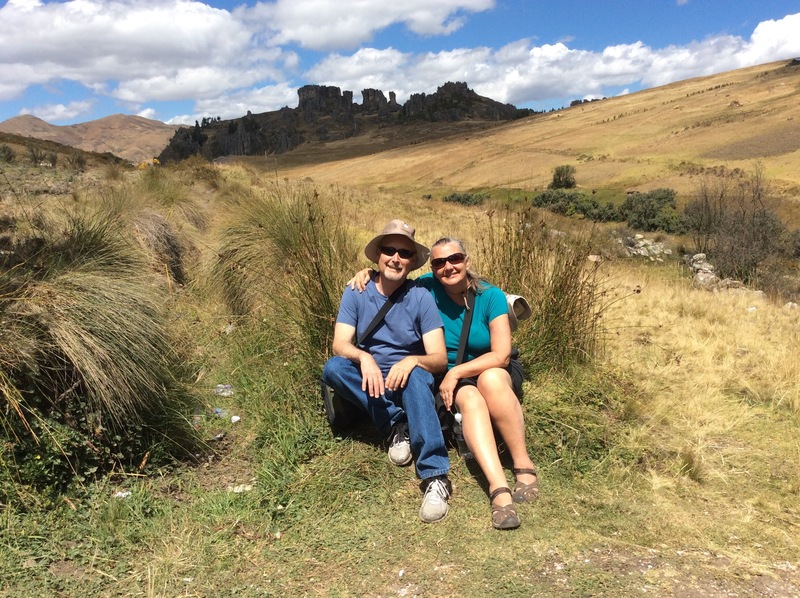 We took an excursion to Cumbe Mayo where traces of pre-Inca cultures can be seen. 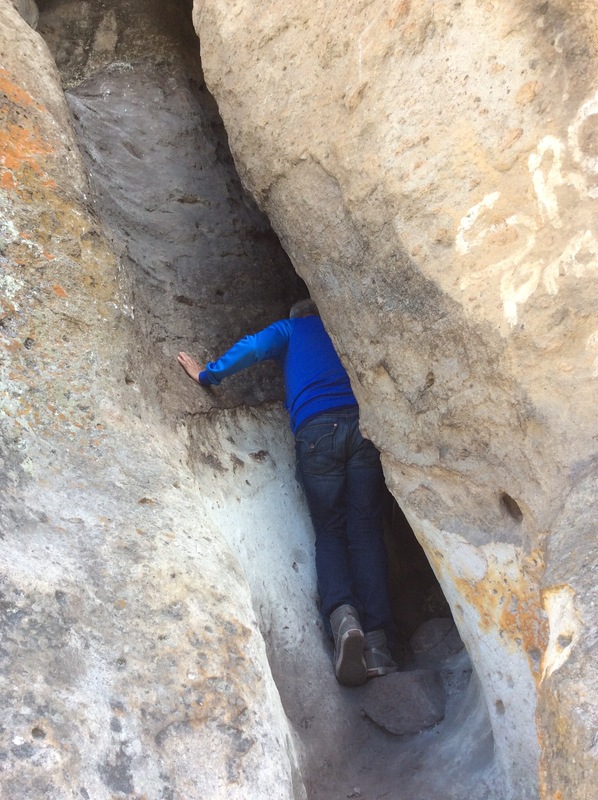 We climbed through a very narrow and dark “secret” passage. At one point I didn’t think I was going to be able to manage it, but I did! 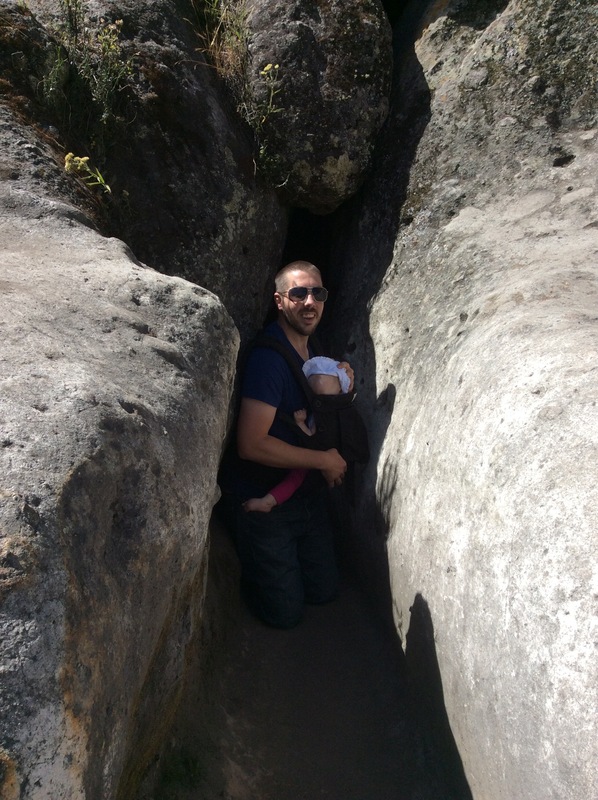 My son-in-law exiting the passageway on his knees with my granddaughter on his chest! 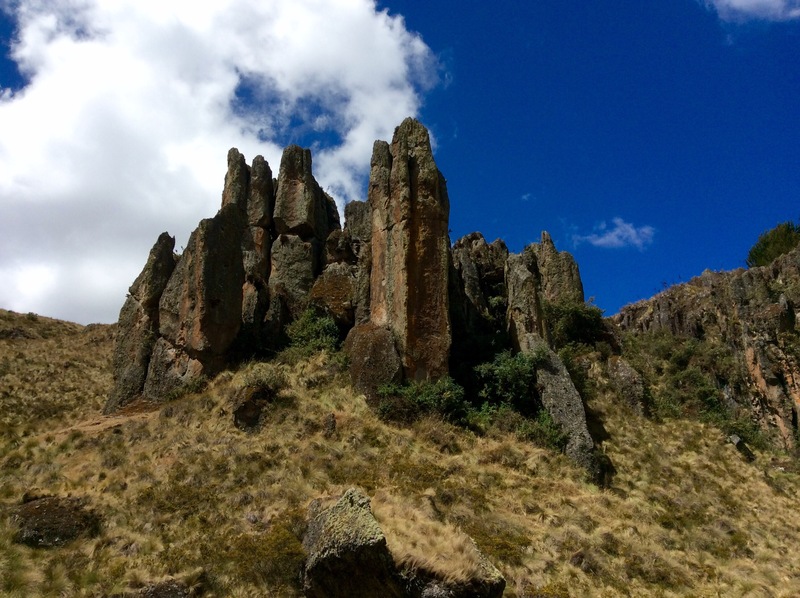 Towering above the Cumbe Mayo, are Los Frailones (The Monks,) massive volcanic pillars, some stretching as high as 60 feet. The stone pillars are in stark contrast to the flat, grass-covered plains and were likely the result of erosion very similar to the monoliths of Cappadocia, Turkey and Meteora, Greece. 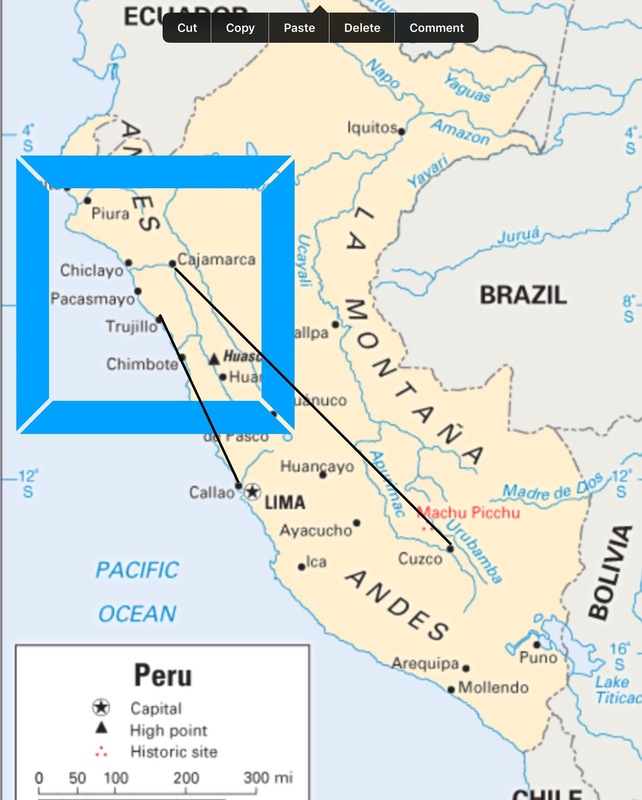 Cumbe Mayo means “Narrow River” in the Quechua tongue. 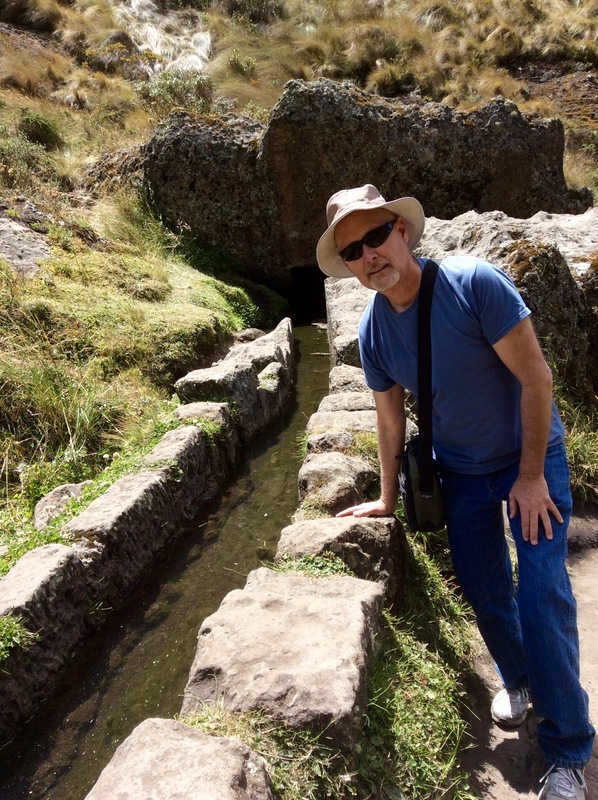 One of the main attractions of Cumbe Mayo is an aqueduct constructed by an advanced pre-Inca society in approximately 1500 BC and is thought to be one of the oldest man-made structures in South America. The canal follows the contour of the land with very little drop in elevation. Modern engineers say they are unable to improve the design of this 3500-year-old 5-mile long aqueduct. 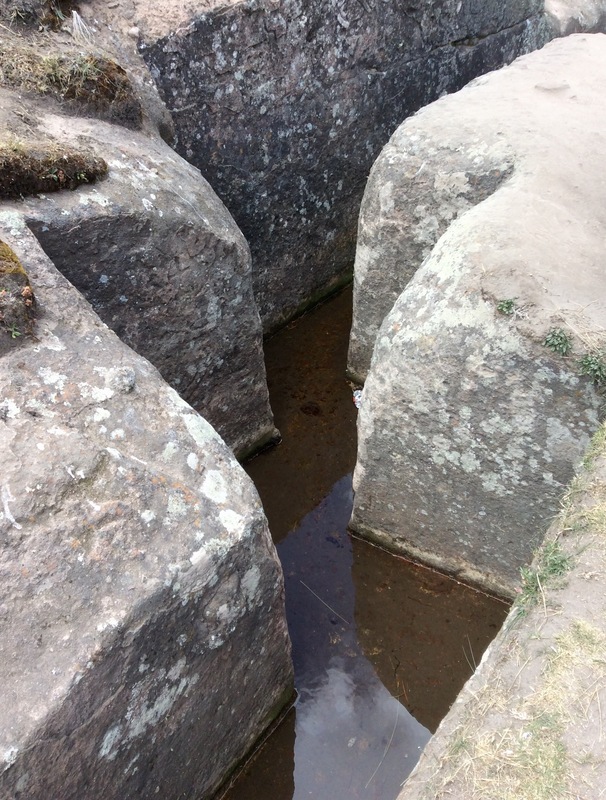 This zig-zag in the stone may have been carved to either slow down the water flow or trap silt. 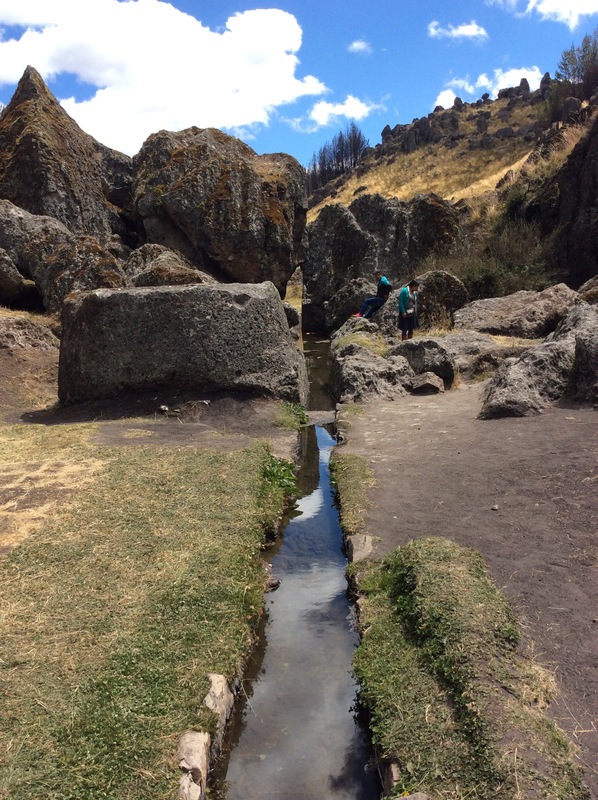 As water was a scarcity, it may have been worshipped by the Cajamarca people thousands of years ago. This huge carved stone is reputed to have been used as a ceremonial altar. 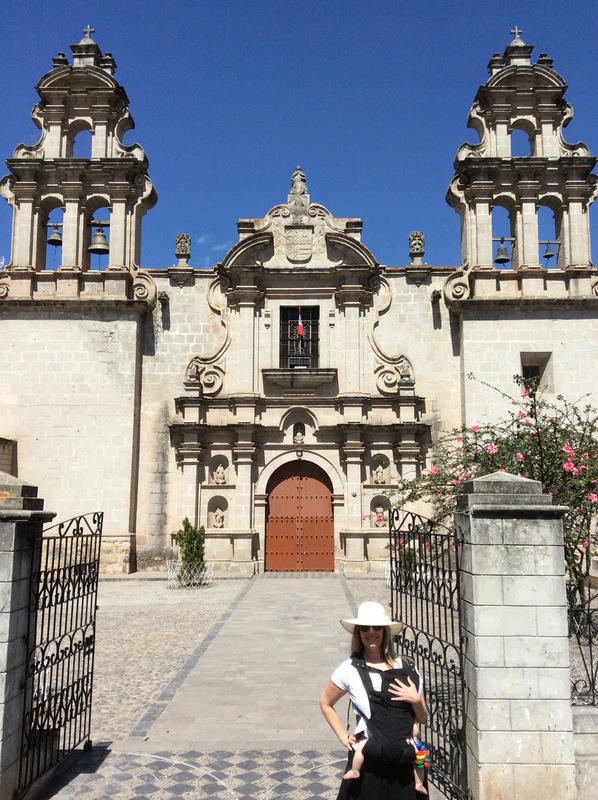 The adventure continues… Meet You in the Morning in Trujillo! This is great information and what a wonderful trip with your family. We are planning to go to Trujillo and Chimpote this fall. 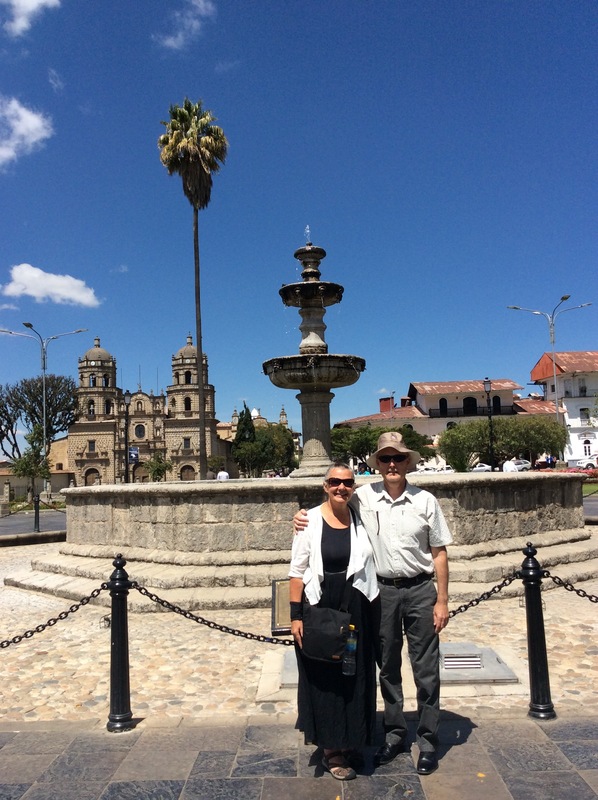 We have already done Lima, Cusco and Puno. I’d like to hear about your trip! I’m the planner in our duo and am getting anxious to start planning. I like to always have something to look forward to. Great post. Even though I was there, I learned some things about Cumbe Mayo from your blog. 😉 This was such a fun day! Yes, let’s travel again – soon.